The Taleban commander Mullah Dadullah has not been captured, a spokesman for the US-led forces in southern Afghanistan has said. Last week Afghan officials indicated they had caught the commander, who is believed to be the Taleban's military leader in southern Afghanistan. Mullah Dadullah is also high on the US most wanted list. The US military spokesman said although a senior Taleban member had been caught, it was not Mullah Dadullah. "We have, in fact, captured a high-ranking Taleban who does fit the general description of Mullah Dadullah but I can confirm to you it is not Mullah Dadullah," Major James Yonts told the BBC. Officials said on Friday the Taleban commander had been seized in the southern province of Kandahar, even though a man claiming to be Mullah Dadullah later told the BBC he was still free, and not far from Kandahar. During two calls to a BBC Pashto service correspondent in Pakistan, the man said he was the one-legged Islamic commander who had been leading Taleban insurgents in Kandahar and Helmand provinces. He said that he would continue to attack Afghan and foreign troops in the area. The man said it was possible the authorities had mistakenly arrested one of the several thousand innocent people who had lost their limbs by stepping on a landmine during the ongoing Afghan conflict. 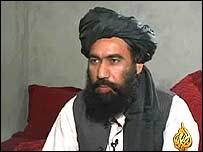 Mullah Dadullah was a member of the Taleban's 10-man leadership council before the US-led invasion in 2001. Correspondents say that news of his arrest earlier had sent a wave of excitement through Kabul. It was treated as a huge success of the coalition forces since they launched the latest offensive against the anti-government insurgents in the south.